What happens when you keep working when you should be in bed? That’s the stupid hour. 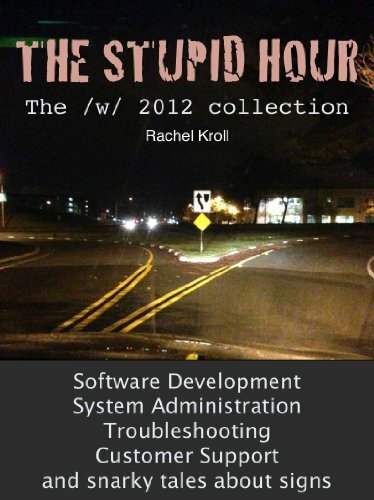 Learn about this and other tales from the world of software development, system administration, working tech support, and dealing with customers. The Stupid Hour is a collection of posts from 2012 with added content not previously published. It is a substantial collection of material intended to inspire, poke fun at bad interfaces, and bring dubious behaviors of the tech industry out of the shadows and into the light. Discover what it’s like to dive into corporate America and Silicon Valley and try to thrive “on the inside”. Witness bad code, weird “brogrammer” culture, and what happens when you try to crack the whip and improve a broken project. Are the free sodas disappearing from your office? Learn that and other patterns which tend to indicate a marked change in a company’s behavior. Know what’s coming before it happens and you can stay ahead of the crash. Have you been tasked with building or running a big system? Dive in to a solid collection of war stories and other “gotchas” from years of dealing with some of the backends behind some of the largest and most popular web sites. Enjoy the many pictures and screenshots of crazy signs, bad interfaces, and generally snark-tastic experiences in the real world. Finally, for those seeking inspiration to build the “next big thing”, there are both ideas and half-baked ideas to get those wheels turning.